“Awake in the Night Land” is my favorite book I’ve read this year, my favorite of Mr. Wright’s, and easily the best-adapted parallel work that I can think of — a lollapalooza of fan fiction. Its Promethean characters are rousing, its Lovecraftian monsters are horrifying, and its Tolkien-esque prose help make it stand as one of the greats among the Dying Earth genre. And dying it is. We begin circa AD twenty one million, and the text tells us plainly we are seven million years before the extinction of mankind. What’s left of humanity survives in the Last Redoubt – a pyramid cities stacked into cities seven miles high – situated on the last source of living energy (the ‘earth-current’). Outside of the citadel is the Night Land, a hellish, hostile, and gloaming landscape full of Night-Wolves, Watching Things, abhumans, Behemoths, Walkers, and evil Powers beyond reckoning. The tales told here center around characters who for some tragic, foolhardy, and brave reason must leave the invulnerable redoubt and venture into the Night Land. Anyone who leaves carries a suicide capsule, to escape death, torture, and worse. So stark is the setting and so heroic the characters traversing it that Wright makes Frodo walking across Mordor look like child’s play. Wright has taken William Hope Hodgen’s work (of which I am not familiar) and constructed a rich, textured story that is as delicate as it is epic. Of what I’ve read, this is without a doubt his most masterful. This entire volume is packed with moments that stick with the reader long after the book is closed, yet some moments tower over all the others. The second scene you reference is one of these. By the stirring in my soul that reading it or even recalling it produces, I must emphatically agree that it carries something decidedly Divine. Another thing I’ve noticed with the Castalia House books so far is the strength of the endings. “Awake in the Night” having one of the best. 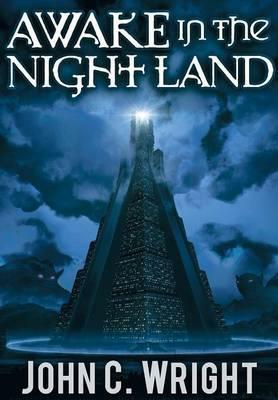 This is an amazing follow up to William Hope Hodgson’s Night Land. I was left wanting more after reading Hodgson, and this offered a richly developed exploration of Hodgson’s world at a micro and macro level. The sum exceeds the parts, it’s a masterpiece made from smaller masterpieces. I really liked this book too, but I’m just commenting to get on the CH mailing list. I also liked the book, and would like to be on the CH mailing list. I agree with Frank and Scott and am commenting for the same reason. First book I read by Mr. Wright. Fantastic read. I had to do a bit of research on the background I was not familiar with the original work. Also, please add me to the CH mailing list. Oh, he’s pretty fantastic. He’s one of those few authors that you know isn’t going to short you a pay-off when it’s all said and done. The Golden Age trilogy is my favorite. Awake in the Night was my first introduction to the work of both Mr. Wright and Hodgson. Awake in the Nightland is incredibly evocative and haunting even months after reading it, improving upon the original material while maintaining the same tone and style. Currently on the third story in Awake in the Nightland. Superb so far. Of the first two stories I still prefer Awake in the Night. I know that Mr. Wright tried to end the second novella on something of an up note, but I just didn’t find it as inspiring as the first one. Still a truly excellent read. That final story was bizarre.